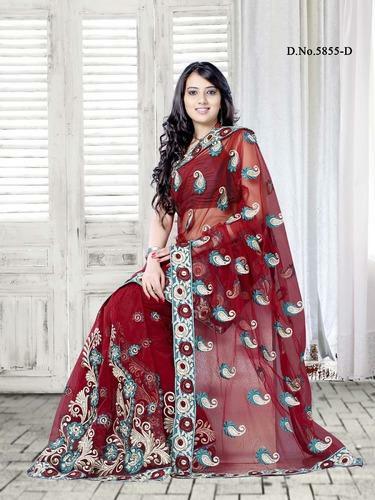 These Designer Sarees are available in various unique prints, they are also soft and comfortable to wear and can easily lure anyone. Our offered range of sari is designed and created by making use of fine quality fabrics, threads and other raw material which is sourced from some of the authentic vendors of the market. We are a 7 years old firm engaged in manufacturing, Supplying and exporting a wide range of Indian dresses like, wedding sarees, Lehenga Choli and more. Apart from these, we also offer hand made & intricately designed Clutch Purses for our esteemed clients. The apparels offered by us like Indian traditional wear, Indian ethnic wear, traditional ethnic wear, traditional designer wear are highly appreciated for their beautiful colour combinations and intricate detailing. Further, the range of purses designed by us is in line with latest market trends and client’s specifications. We have a state-of-the-art manufacturing unit, which is installed with latest machines, that enable us to achieve a production capacity of 500 units. Moreover, we feed urgent orders of complete range of Indian ethnic clothing to competitive markets all over the world, mainly UK, USA, Canada, Asian & Gulf countries. Apart from this, we provide excellent delivery services, as we delivered all goods within 72-90 hours to any part of the world. We also have a separate merchandising division for sourcing the fabric and other accessories that are used for adorning the garment. We even have a separate dying unit, in-house laundry section, marketing department, which acts as supporting units to our production house. In addition to this, we lay a lot of emphasis on the packaging and transportation thus make use of quality packaging material like corrugated boxes, cartons and sheets pack our range of products that assures safe transit of the consignments. We are looking for queries from Overseas Countries like UK, US, Australia, China, Denmark, France, Netherlands, New Zealand & Norway. We are looking for enquiries from UK, USA, Canada, Asian & Gulf countries..